Adelaisa Vendicci is an Imperial citizen who works for the East Empire Company in Solitude. 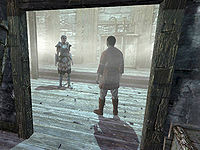 She appears during Rise in the East, when she visits Windhelm's East Empire Company office to check on its condition. She later boards a ship with you to assault the pirate gang Blood Horkers, and can be recruited as a follower afterward. Adelaisa Vendicci wears a set of Imperial armor, Imperial bracers and Imperial boots. In combat she will rely on her Imperial sword. She also carries a belted tunic, the East Empire office key and a selection of common items and gold. Talking to Orthus first will have him introduce her: "Just in time. This is Adelaisa, one of my superiors from the Company. She's been dispatched to... eh... see to it that we get back on schedule. You should probably speak to her." Now speak to Adelaisa and tell her you know where the Blood Horkers are. She will be glad to have you by her side: "Finally, someone around here that can get things done. Since we're short on soldiers you'll be coming with us, too. No arguments." She will ask you, "Anything else you want to say? ", so inform her that the Blood Horkers' leader is Haldyn, and she will reply, "Haldyn? I've heard of the man, but never guess he'd join up with some pirates. This could be even more dangerous than I thought. Head to the ships. We'll plan the assault on the way." Once she has addressed you, she will stay in the building until you board the ship to Japhet's Folly. During the journey, the ship will come to a sudden stop, anchoring near an island covered with a strange fog. Approach Adelaisa and ask her about the plan, and she'll say, "Well, here we are. We think." When asked if you've reached Japhet's Folly, she will answer, "Hard to say. The weather's taken a bit of a turn, here. Haldyn's been known to obscure his hideaways with magic. If we take care of him, the way should be clear to properly assault the island." She will confirm that it is your job to dispatch him: "You've shown yourself useful so far. All these lunks are too afraid of Haldyn to head in before the fog's cleared. So if you're willing to perform one more service for the Company, we could put this matter behind us for good. Take out Haldyn, and we'll handle the rest." Once Haldyn lies dead, return to Adelaisa, who is waiting at the docks. Upon greeting her, she will say, "There you are." Bring her the good news and she will be pleased: "Impressive work. We started the attack once you made the fog scamper away like that. Hope you didn't catch any of the fire." She will offer to return to Windhelm, telling you, "We can head back whenever you're set. There's celebrating to be done! Are you ready to go?" When told let's go, she will reply, "All aboard!" If you instead tell her not just yet, she will respond, "Let me know. We shouldn't stay here all day. My men want their mead." Upon reporting your success to Orthus, he will be grateful for your deeds, hoping that perhaps "Adelaisa will finally ease up". Now that the Blood Horkers have been taken care of, she will have a new responsibility to inspect the East Empire Company office. At 7am she walks down the streets of Windhelm for a breath of fresh air. She eats some breakfast at 8am before she returns to work at the office at 9am, staying there for ten hours. At 7pm she spends the evening dining at New Gnisis Cornerclub, though she was intended to go to Candlehearth Hall as well (see bugs). At midnight she goes back to the office, though she was supposed to sleep by now. She will often thank you for helping her company get back to its feet: "We can't thank you enough for helping us get this office running. ", "I appreciate everything you've done for us, but I really am quite busy. ", "Glad Orthus was able to find someone competent to help out. ", or "You handled yourself pretty well back at Japhet's Folly. We'll remember that." She will also greet you cheerfully: "Hey, it's our hero! Seen any more of those pirates around here?" Although her default gear is governed by the Heavy Armor skill, Adelaisa is actually more proficient in Light Armor. 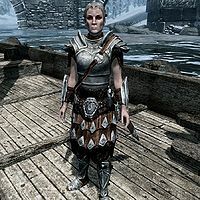 This issue has been addressed by version 2.0.4 of the Unofficial Skyrim Patch; it changes her class to CombatWarrior1H. Adelaisa's schedule seems to have discrepancies: her package name indicates that she should sleep from midnight to 7am, but there is nowhere to sleep in the office. This bug is fixed by version 2.0 of the Unofficial Skyrim Patch. On Morndas, Middas, and Fredas, she was also supposed to dine at New Gnisis Cornerclub from 7pm to midnight, while on other days she chooses Candlehearth Hall, but the schedule always points to the Cornerclub.